Today is January 1, 2017. It is the beginning of a new year. This past year has been a year with ups and downs. The battle with ALS continues for all of us. We have learned many things over the past year, and I wish to touch on some of them in this posting. Kay and I passed the magic five year mark since my diagnosis in November of 2011, and four beyond my one year sentence. But this goes well beyond just being one of the 20% of PALS that reach that mark. The true blessing is that life is good, and as to my continued improvement, there is no end in sight. I have every intent of being one that exceeds the 20 year mark. By then, at age 83, I hope to be shooting my age on the golf course. They claim no one has ever completely healed from ALS. I expect to prove them wrong. We are thrilled with the number of you that visit our website, and even more so, by those of you that we have come to know personally. We love talking with you, or better yet, meeting you in person or on Skype or FaceTime, and treasure those opportunities. You are continually in our thoughts and in our prayers. Those of you that have followed our website, and have come to know us, know that both Kay and I believe that the greatest healing force for ALS lies in the human spirit. It lies in our hearts and in our minds. Though the many physical tools such as nutrition, supplementation, detoxing, etc., are important, these are all secondary to the power of our minds, our faith, and our will power. So what about when we feel set-backs, or become discouraged, and even perhaps tired of the continual fight for that inch of ground in front of us, especially when that ground we are fighting for seems so elusive? This past year, I feel I have learned a little better, how set-backs affect us--affect me. The year 2016 started out well. We were in Yuma, enjoying the warm weather, playing some golf, and attending to a little business, as usual. I have experienced mild ups and downs ever since my original diagnosis, but always seemed to make the down-turns brief and minimal. The progress upward has never been extraordinary, but steady. Then on February 19th, we received word that our 38 year old daughter had taken her own life. There is little doubt that this experience is in all respects the toughest of my life, even including ALS. No, I don't feel I am responsible for that heart breaking incident, but there is no doubt in my mind that if we had been home, and that I had been doing a better job as her father, things would have been different. Things should have been different. After a two week trip home, taking care of our responsibilities as best we could, we returned to Yuma. Then we returned to Idaho just two weeks later to be with Kay's mom as she passed from this life March 14th. But there was no agony here. She had lived a full life and lived it well. There was sadness, but little heart ache. I also started doing some remodeling work on our home upon our return, which resulted in exposure to a lot of dust and smells I did not properly protect myself from. During this time, especially with my sleep habits in the tank, I notice my weight and my energy level dropping, breathing issues resurfacing, and no doubt, a decline in my morale. When we realized what was happening, we decided we'd best jump back on the horse and get on with the ride we were neglecting. We upped the detoxing therapies, including our use of ozone and hyperbaric treatments. Perhaps the most important thing we did was to become involved with another PALS and his wife Sharon and Rainbo from Oklahoma, that visited our home for two three week segments during the summer, as he battled his ALS. Whether they realize it or not, they did much for us than we did for them. And yes, it helps that Rainbo is a golfer. It is now going on 11 months since the loss of our daughter. We are again back in Yuma, escaping a nasty Idaho winter. My weight is back up to 190 from 175 in the Spring. I am swimming again, and getting in my golf, occasionally walking nine holes. And I am sleeping again. The thing I have learned from this is that this is an up and down battle. Set-backs are almost inevitable, but they must be viewed as temporary lulls and not turning of the tide of battle. The following is a link to Healingals.org that I would recommend every PALS review. There is a message from Steven Shackle, a 20 year ALS survivor, and two videos, one from a young man, Nick Vujicic, born with no arms or legs, and another by Shawn Achor, talking about those "outside the norm". My challenge here is for each one of us to become the "red dot above the curve" until the curve comes up to where we are. I wish a joyful and healing New Year to every PALS. Regardless of where each is with our battle against ALS, stay in the fight, find joy in living, and lift those around you. We want to share with you some natural ways to stay well. Don't think you have to read all of this at once. There is a lot here. These are ideas for you to study and determine if they are right for you. All of us, whether we have ALS or not, can do things to protect ourselves from illness. PALS certainly need to be cautious. Right after Kim's diagnosis, his primary doctor told him to get a flu shot. Kim said, no thank you. What we may not have been aware of that the time was just how many toxins are in vaccinations. When you have a body full of toxins which we feel is true of PALS, we don't think it is a good idea to add more toxins like mercury and formaldehyde. Below are two articles that also contain information on staying healthy. The second article is a prevention technique on getting rid of Roundup in your life and why Roundup is so dangerous. Vaccine Safety - Is your doctor pushing a flu vaccine on you every year? Colloidal Silver. We learned about colloidal silver a few years ago. Dr. Mercola has most of the answers. See link below. We get our colloidal silver from www.utopiasilver.com. Dr. Mercola also sells his brand. I don't get it from health food stores because the cost is very high and I don't know if the quality is good. If Kim starts to get a sore throat or cold, I put a teaspoon of colloid silver (no taste to it) in his drinking water for a day or two. He bounces right out of whatever was bugging him. As you can see, www.mercola.com is my go-to place for finding health answers. There are also essential oils that help with health issues. We have used melaleuca oil and cinnamon bark oil to resolve fungus or mold issues. For Kim fungus was in his lungs mostly, so we will diffuse the oil into the air. OnGuard is also a very helpful blended oil. You can buy the DoTerra brand of OnGuard on amazon.com. It is especially helpful to take before and after a medical procedure. Taking an antibiotic for a viral infection is of no value because antibiotics only help with bacterial infections. Certainly an antibiotic should be used for a life-threatening infection and have certainly saved lives, but they have been overused and are creating a whole new problem - superbugs that have morphed and are no longer killed by antibiotics. Our government has also allowed the use of antibiotics in animals that we eat, chicken, beef, turkey, etc. The benefit for the farmer is that the animals fatten up quicker and they can get them to market quicker. But we are also getting those antibiotics through the meat we eat and destroying our good gut bacteria leading to all kinds of digestive issues. PALS need good gut health in order to process nutrition and get well. Colloidal Silver - Can help fight off infections. We have been getting our colloidal Silver from www.utopiaslver. We feel it is of the same quality as is spoken of in the article below. Two thousand years ago, the Greeks and Romans used silver containers to hold and protect perishable liquids against harmful organisms. Silver containers were used until the invention of refrigeration to protect food liquids such as milk from spoiling. Using silver in the medical setting came into practice about one hundred and fifty years ago as a means to protect the body against infection. It remained popular against harmful organisms until the advent of antibiotics. Colloidal silver is a preparation of silver particles in a pure solution. When properly produced, these microscopic silver particles carry a positive ionic charge that makes them effective against harmful organisms. Colloidal silver produced with high voltage technology is the most bioavailable and safest form of silver. Silver products made with low voltage means are lower quality and can be ineffective and even contribute to argyria if consumed in excess. This is why it is so crucial to seek out a high-quality colloidal silver supplement produced with high voltage technology from the purest silver and distilled water available. Although many organisms have adapted to resist antibiotics, silver’s cellular disruption continues to remain effective against common damaging compounds. Fortunately, silver is nontoxic and shows no sign of micro-organism resistance. Here are some amazing and inspirational stories. Not all are about ALS, but the power to use your mind and your initiative to heal under difficult circumstances. The movie from Deb Wot is so powerful. It is not about ALS at all but about how you have to address your mind set to ALS to make it go away. Story of Dr. Wang, diagnosed with ALS in 1983, was going down fast until he started using Falun Dafa therapy. Deb is a scientist whose sister has ALS and she does enormous scientific research on ALS. After the movie link are her comments. I am watching this movie, http://miraclemindset.com/world-premiere/. I really need healing stories and the best quote in this video is "Our bodies have brilliance, they are designed to heal." To put this into perspective in ALS, there are things the body is doing that just looks so damaging, and I see time and time again researchers try and stop that thing that looks damaging and by stopping the damaging thing the disease progresses faster. The body needs to be given things to help it to find its path to healing and when I look at the ALS healing miracles, every last one was detoxification and nutritionally based, with support to detox and support good microbes over bad microbes, Dr. Craig Oster, Kim Cherry, Nelda Buss, Steven Shackel, and others. I spent all summer working on the video on ALS and microbes that I made, and when I started I thought going after herv-k was the most important thing, but as I made the video and researched deeper, the value of working on how to best support nutrition to help the body do what it needs to do became abundantly clear. The body is destroying the lining of the gut as this disease progresses, but it isn't doing that on purpose, it is a side effect of the body fighting to prevent the clumping of the proteins around the brain from sticking together. What helps to prevent the clumping also results in the stomach lining having problems. In 2015 when Dr. Sun et al published their paper, "Leaky intestine and impaired microbiome in an amyotrophic lateral sclerosis mouse model," my number one question that has been on my mind since is why did the mouse get a leaky gut. For a few months now something I saw in the research made me think that the body was deliberately harming the lining of the gut and it made no sense to me, but then when you look at the "stickiness" of the proteins, well what helps that reduces the gut's ability to get what it needs and then the body is spending too much time fighting the extra harm from having a bad gut. Dr. Sun's next paper showed that a simple gut support of butyrate dramatically slowed down progression. This means something as simple as a tablespoon of butter every meal can help. The mice's water contained 2% sodium butyrate, so they got a little dose every time they drank. More is not better as there are reports that too much inhibits neuron renewal, which makes sense, with enough the gut protects against stuff that harms the neurons so less neuron renewal is needed. We have heard from a number of PALS that indicated that they were going to go off the gluten-free diet in an effort to gain weight. We realize that maintaining (healthy) weight is important and one thing that PALS have a difficult time doing. We believe the reason for that is the health of the gut. If a round of antibiotics has been your method of clearing up infections, you must realize that along with the bad bacteria, the good bacteria has also been destroyed. That leads to further health issues. The bacteria breakdown in the gut should be 75% good and 25% bad. That provides enough good bacteria to keep the bad in control. With an impaired digestive tract, nutrition cannot be processed. Another factor that some feel is causing the nutritional deficiency is what is called a leaky gut and gluten can be one major cause of that. Kim feels one of the most important steps he took was getting rid of the gluten (though he loves bread and sugar more than about anything. Well, maybe he loves me more. Maybe.) Getting rid of the gluten helped reduce his glutamate levels and the inflammation in his body. He began breathing better as we worked the fungus out of his lungs. Anything that creates inflammation also creates fungus. He did decide that breathing seemed more important than bread and sugar. He stressed over his weight loss for several months and then realized that the weight he lost was junk weight. It is muscle that you need to maintain, a difficult task with an ALS diagnosis. Deb Wot put the following article up on facebook this week, and it has helped me understand what glutamate is, how it is good and how too much of it is bad. Excess glutamate is directly related to gluten intake as well as dairy intake and all forms of MSG and chemical toxins. If you are eating processed foods, you are getting MGS (monosodium glutamate) in addition to some of the 8000 chemical additives that the FDA has approved for our "foods", if you can call them that. This article is written by Cynthia Perkins who has a real issue with keeping glutamate balanced in her body. Her research is excellent and she gives excellent suggestions as to how to not get too much glutamate and how to keep it in proper balance with GABA. I will summarize the article a tiny bit, but you need to read it, maybe several times to understand most of it. Some of it is a bit technical. Glutamate (which most PALS have too much of) is a primary excitatory neurotransmitter. Important rolls include stimulating your brain cells so you can talk, think, learn, pay attention and store information. However too much results in neurological inflammation and cell death. Glutamate over productions comes from gluten, dairy, stress, and all the toxins we have discussed on this site. Not enough GABA comes from too much glutamate. So read and learn. We continue to learn and you must also. The body is incredibly complex. You will get a better feel for that in reading this article. ALS is not just one thing wrong. It is multiple issues in the body. Each has to be corrected, and the corrections that need to be made are different for each individual because we are all biologically different. With every bit of learning, we hope you are finding hope and the courage to make the course corrections to heal. You are the captain of your healing journey. Study and pray for guidance. This is Kim writing this post. Though I leave most of the work of maintaining this site, and providing what we consider to be valuable and pertinent information to Kay for the most part, I try to stay abreast of as much as possible. Our goal with this site is to help other PALS find a way to accomplish what Kay and I have with our battle against ALS. We are very sensitive to the cost so many of us incur and the lack of insurance assistance in the great majority of treatments we have used. We are constantly searching for treatments and resources that will allow each PALS to not only control the costs of healing, but to empower each to maintain control of their own program. I discovered an article about a technique known as EWOT, or Exercise With Oxygen Therapy a few weeks ago. I had heard of this treatment at least a couple years ago, but did not explore further, feeling our protocol was doing a good job of maintaining our progress. However, I was intrigued with what I saw in the intro video on the internet, and ordered the book by Dr. Mark Sircus titled Anti-Inflammatory Oxygen Therapy. His book explains the benefits of the therapy and other important related issues, but neither offers the equipment for sale, nor does he promote any particular source. To me, this particular detail diminishes potential conflict of interest and validates his writings. We have always felt the core of our protocol and the key to its success has been the increased oxidation of my body. This includes the ozone therapies and the hyperbaric treatments we have done, augmented by the diet and supplements. The program promoted by Dr. Sircus fits right into our beliefs and findings. EWOT is a program that increases the oxygen content of our bodies, and may perform much better and faster the HBOT (Hyperbarics), and at a fraction of the cost. Both Kay and I have been on the EWOT program for just over two weeks now, and are feeling the benefits. Though I continue to do the ozone IV and insufflation treatments, we are retiring our hyperbaric chamber for the time being. We encourage, as always, each of you to study and research to see if this program can benefit you. As a parting note, I generally like to see what all the "Quack Watchers" have to say about the new things we discover. I was not surprised to find negative and insulting references to both EWOT and Dr. Sircus. My response to them is simple. Show me one single neurologist that has treated a PALS that was in the condition I was 5 1/2 years ago and had the success I have had. Unless that PALS so treated can keep up with me on a round of golf, match me in swimming, or can help me put in a sprinkler system I just completed, the Quack Watchers need to keep their opinions to themselves. The first article appears that it might be negative toward oxygen therapies, but read the whole thing. We are taking 1/2 teaspoon of baking soda with some magnesium mixed in a glass of water 1/2 hour before starting the exercise session. This is to help drive the oxygen into the cells. For further information on baking soda (sodium bicarbonate) and magnesium, go to www.drsircus.com and read his articles on those subjects under his Articles tab. Baking soda will help detox heavy metals. We will have more of an update on the EWOT next month as we have had more time to test it out. 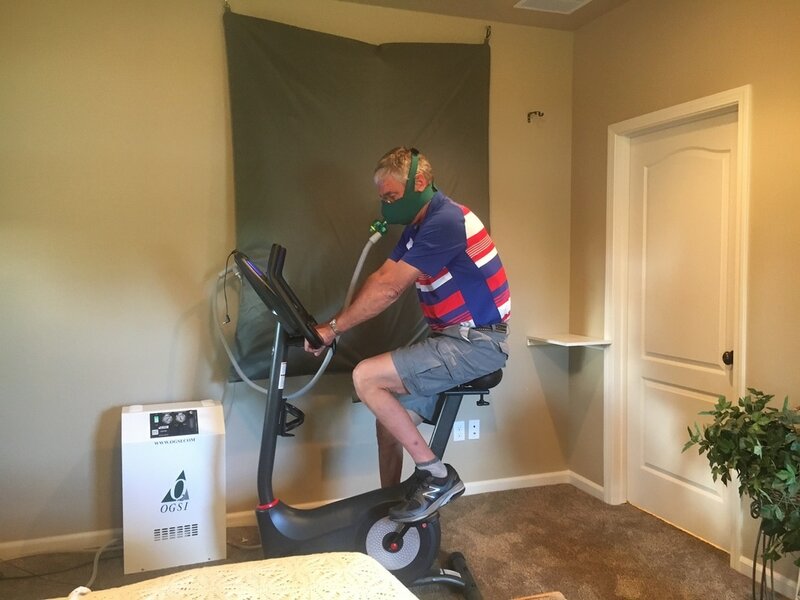 Photo shows Kim on stationary bike with breathing mask and tube that goes to the oxygen storage bag. The bag was filled with the oxygen concentrator that we had with our hyperbaric chamber. Kay's thoughts on pH balance. I first studied the importance of pH balance years ago after the doctors prescribed the bone drug Fosamax for my supposed osteopenia. What I learned was the there are two components to the bone, osteoblasts and osteoclasts. One brings nutrition into the bone and the other helps sluff off the bad stuff. Fosamax, on of the premier bone drugs, destroys one or the other. When I refused to take the drug any longer, the doctor says, "Well, then walk 10,000 steps per day." WHY WAS NOT THAT MY FIRST WORD OF ADVICE???? What I later discovered was that I had quite heavy lead poisoning, so after working a year to correct that issues, by bone scan test showed a correction in my bone mass. Why do I tell you this? Because a major factor in healthy bones is the acid-alkaline issue. Our bones do not like an acid environment. Our bones are not the only thing that suffers from an acidic body. Our whole body is out of balance when the acid-alkaline balance is tipped either way. Disease loves to live in an acidic body. Here are some sites below that discuss the pH balance issue. There are discrepancies between each one, so you may have to determine what will work best for you. Eric Edney, in his book, Eric Is Winning, said that when he started his ALS healing journey his pH levels were about 4.5, a very dangerous acidic level and that he got his pH up to 8.5. 8.5 may not be the best level either. He felt that the biggest reason for his ALS diagnosis was a very toxic drug he was given improperly multiple times to kill a bug he picked up in Mexico. Drugs are very acidic as was his alcohol habit. Eric has since passed away 20 plus years after his diagnosis, but not from ALS, rather the effects of a stroke and heart attack. So consider testing your acidity alkaline levels, especially if you are taking any kind of drugs. Below is a more scientific site, but has a great chart at the end showing which foods are more or less acidic and more or less alkaline. In September of 2017, Dr. Mercola put up an article about pH balance and discusses more information about pH balance and electrical voltage in our body which is the same thing as pH balance, and is the research of Dr. Tennent who has three viruses in the brain that the medical field could not resolve. In my studies over many years on pH balance, I have never seen it described this way. There is some very important information in this article that relates to all with ALS or MND. He talks about how to get mercury out of the cells which may be a huge missing factor in healing ALS. In addition, Dr. Tennent mentions fulvic acid which I knew nothing about. I found an article by Dr. Josh Axe that gives more information on that. I am including that article following the Mercola article. Our prayers are always with you to find the right answers for your healing. As noted in last month's posting, we have incorporated a new therapy into our protocol known as EWOT, or Exercise With Oxygen Therapy. The concept is that oxygen is the key to better health in just about every situation and for every condition. Though we still have much to learn, we are still excited about EWOT, and feel we are gaining significant benefits. I remember well how I struggled to breath 5 1/2 years ago. It is exhilarating to go thru a 15 to 20 minute workout on the stationary bike, breathing some 25 to 30 breaths a minute, sweating profusely, yet not feeling oxygen deprived. Most any PALS, either in the later stages, or with Bulbar issues as I had, knows precisely what I am saying. Perhaps the greatest single benefit I have noted is that I am sleeping better, more soundly, and longer. Shoot, some nights I will get in as many as 7 or 8 hours. I still become a bit frustrated because I do not have the endurance I have enjoyed most of my life until about 7 years ago, but I also must remember the advancing years have a little to do with that, as well as the ALS. By the time 10 or 10:30 rolls around, sometimes much earlier, I am always ready to call it a day. My weight is down just a bit, most likely due to the warm weather and all the work in the garden, but Kay swears the atrophy in my right calf is continuing to decrease. She notes this from those sweet feet and calf essential oil massages I get most every night. And yes, there are definitely upsides to being the patient. She spoils me terribly, and I just have to put up with it. There are writings and publications extolling the benefits of EWOT. I have yet to find any that relate directly to those of us that are battling ALS. Yet common sense tells us the benefits to PALS is equal to that of any other disease or condition. The increased oxygen transfer to our bodily cells will make everything else we do - diets, supplements, detoxing, etc., more effective. Even the emotional, mental, and spiritual aspects we feel are so critical in this fight will feel a boost. As we mentioned in last month's post, one very significant benefit of the EWOT system is that it is so much more affordable, as well as convenient. We already had a couple oxygen concentrators. We spent less than $1200 on the EWOT storage bag and breathing masks, and other equipment, and another $360 on a nicer exercise bike, all this versus the $25,000 we spent for our hyperbaric chamber. Though you can spend 2 to 4 thousand dollars on an oxygen concentrator, there are better deals out there. You may also find good used or rebuilt concentrators by searching on-line; eBay, Craig's List, local newspaper outlets and websites and I am sure other places, for much less money. (We paid about $250 for our last 6 liter machine after our $2500 machine died over three years ago. It still works great.) Though it is nice to have a 10 liter per minute oxygen output, a 5 liter machine will also suffice. It just takes longer to fill the oxygen storage bag. We purchased our system through EWOT-USA.com. We have also benefited by the use of another website, Promolife.com, that soon will be carrying EWOT equipment and supplies. We have asked that both companies offer a discount to those fighting this battle with us. Both are appreciative of the contacts coming from you, our PALS. But those kickbacks will go directly to each of you, not to us. Just mention Kim Cherry to get a discount on your order if you decide it is a good option for you. Our reward will be hearing from you of the benefits we hope you will discover. We again stress the importance of baking soda and magnesium. We are taking 1/2 teaspoon of baking soda in a cup of magnesium water 30 minutes before starting the EWOT session of about 15 to 20 minutes. The magnesium we are using is magnesium chloride flakes. The flakes just dissolve in water and in fact, you must keep them dry until ready to use or they will dissolve in a humid environment. To make the magnesium water, add 1/2 teaspoon of magnesium chloride flakes to one quart or liter of water. These two supplements help draw the oxygen into the cells. The baking soda also helps to alkaline the body and the magnesium helps with detoxing among many other things. This is all documented in Dr. Mark Sircus's book, Anti-Inflammatory Oxygen Therapy we referenced last month. It is a very good read. We ordered our magnesium chloride flakes at www.myworldhut.com. Kay bought 5 pounds for about $40 which included the shipping. That will last a long time. We also noticed that the flakes are sold on www.swansonvitamins.com in 2 pound bags. You could drink the magnesium water through the day to get more magnesium. We are so proud of all you PALS that have the courage and fortitude to battle ALS. Many of you are making good progress. We love hearing from you, and speaking or Skyping/FaceTiming with you. We try to keep a file on every contact. We consider you our family. You are constantly in our prayers. May God Bless You, all our PALS, and those that are supporting you and loving you in this courageous fight. EWOT USA will offer PALS a 15% discount if you request it. Promolife now has their EWOT system up on their website that can be found at this link. They will give a 10% discount. Before covering the subject of Lyme disease, we want to make an additional note about the EWOT therapy. We are gathering some additional information as to how to properly administer it. One doctor says to use baking soda and magnesium with EWOT and another says to use ozone. We will put at EWOT update tab just below the July 2017 tab (and will be left as a sub tab under 2017 updates even after July) as we learn more and try to decide what is best. Kim has used ozone for years and has always felt that was one of his best detoxing therapies. We feel that magnesium is critical for PALS and know that it is important to have a pH balance in our body above 7, but how it relates to the EWOT, we are still not certain. Kim is getting muscle back in the right atrophied calf which was lost about 6 years ago after about 2 1/2 months on the EWOT therapy. More to follow. Lyme disease can often be a leading issue for ALS. Lyme can often hide in the body for years and then an injury or event can throw it into activity. Lyme is also a very painful illness. It is usually treated with antibiotics in the standard medical industry, but Lyme has the ability to hide from antibiotics and form a biofilm around itself to protect itself from destruction. Often treating Lyme with antibiotics makes the issue worse and since antibiotics destroy the good bacteria in the gut as well as the bad bacteria, it can really impact a PALS with bad digestive issues. Kim’s issues were not associated with pain like so many with ALS experience. His issues mainly stemmed from his inability to breathe. However, so many PALS could also have Lyme or they are diagnosed with ALS when it could be Lyme. There is a lot of information here, and lots more available on the internet. Certainly, what I have included is not comprehensive, but a starting point. You must study and determine what is right for you, if Lyme is an issue and how you can best address it. Lyme info from Wake-Up World and written by guest writer Dr. Joseph Mercola. It is an excellent article to help understand Lyme disease. We have some friends who do a lot with the doTerra essential oils, and they used essential oils to completely rid the husband of Lyme. I spent some time with them today (June 5, 2017) and wish to share some of their information. The husband, Steve, was diagnosed with Lyme in about 2005. They were living in Loudan County, Virginia, which is one of the Lyme capitals of the world. An easy starting point could be 3 drops of lemon and 3 drops of frankincense under the tongue. This could help prepare the body for the next step which Steven did. DoTerra also sells a vitamin pack called the Lifelong Vitality Pack (three bottles of supplements) that may also help the body prepare for the Lyme detoxing protocol. Steven began talking 3 drops of lemon oil, 3 drops of oregano oil and 3 drops of melaleuca oil. (Some people may need to start with a smaller amount.) The drops could be put in an empty veggie capsule. Lemon oil breaks down toxins. Melaleuca helps to break down the biofilm that Lyme builds around itself. Then Steven was drawn to the citrus oils. Wild Orange helps reduce inflammation, helps strengthen the immune system and helps with sleep. Lime oil lifts the spirits, eases depression, helps break up mucus and helps with sleep. Grapefruit oil helps the lymphatic system to drain. I learned from the Hales that quorum sensing is communication between bacteria and proteins in an effort to keep bacteria alive and in a healthy environment (for themselves, not us.) It gives bacteria the ability to draw in more bacteria and viruses for their benefit -not ours. Essential oils have the ability to scramble that communication and thereby help us to stay free of bad bacteria. Grapefruit oil and cassia oil are especially good at breaking those communications. (Kim has put drops of grapefruit oil in his drinking water for about 3 years with the intent of increasing glutathione. The grapefruit oil probably has many good properties.) You can google quorum sensing if you want to learn more about it. Another therapy is to take a pitcher of water and add 2 drops of grapefruit oil and 2 drops of cassia then drink throughout the day. Cassia oil is a very powerful anti-mold, anti-fungus oil. Steven or his wife, Kristine, would be happy to share his story and protocol. If you are interested in contacting them, let me know and I will give you their contact information. Steve’s story follows. When I first started using essential oils for my symptoms, it was a hit and miss effort. I started on a daily wellness program by using the doTERRA Lifelong Wellness supplements (before Lifelong Vitality) and to use Frankincense, Balance and OnGuard oil blends daily for overall general good health. I then added Oregano, Thyme, Melaleuca, Cinnamon, and Clove essential oils to my regimen. Lastly, I added citrus oils. I had no information on how much of each to take nor how. I just took a lot of everything and I used them topically, internally and diffused them. I took them together and individually depending on how my instincts seemed to dictate. I downed a whole lot of the citrus oils internally. I started to feel incrementally a little better. As time went on and I learned more, I found a specific regimen seemed to work best for me. Here is what I found for overall wellness and to put the body into a stance to be able to fight most ailments: Lifelong Vitality (daily), GX Assist (10 days per month), followed by PB Assist (5 days per month), and Frankincense, OnGuard, and Balance (daily). Then specifically for my symptoms: two to three drops each of Oregano, Clove, Thyme, Cassia and Melissa oil (twice daily). I added citrus oils to every glass of water throughout the day. Any citrus oil is fine, but I like Lemon and/or Citrus Bliss best. A couple times a week I added a drop or two of Patchouli on the bottoms of my feet as well. I still use everything mentioned above. However, I now use them sporadically (maybe just once or twice per week), because I have already eliminated all my former symptoms. I don't want those symptoms to come back, but I feel that a couple of times a week seems sufficient. I will always be dedicated to utilizing the overall doTERRA wellness program to fight pretty much anything as mentioned in the second paragraph above. Though many ailments can be helped relatively quickly by the proper use of CPTG essential oils, serious ones will take consistent long-term effort to feel whole. I felt IMMEDIATE IMPROVEMENT when I switched exclusively to using doTERRA essential oils and supplements. However, it took me eighteen months to be completely free of all symptoms (which had included severe neurological headaches, joint pains, extremely low energy levels and depression). ALL GONE thanks to the CPTG (certified pure therapeutic grade) quality of all doTERRA products. Also, I should mention that at times the die-off was too much for my cleansing organs and I developed significant skin rashes. I found that essential oil baths, doTERRA Zendocrine herb capsules & Zendocrine Oil, and significantly increasing water consumption to be very necessary to help control these skin eruptions. From my research into this issue I found, from a number of credible sources, that these bacteria seem to be able to morph into a cystic inactive stage where it is impervious to regular antibiotics. It then reemerges out of that cystic state (where it has been hiding) to resume its destructive efforts when our body's environment is less resistant to its existence. Though essential oils still seem to be able to penetrate and have cidal effect (meaning capable of killing), it is not yet proven to be able to eradicate all bacteria during its cystic stage. IT IS IMPORTANT TO DO A COMPLETE ESSENTIAL OIL PROTOCOL OVER AGAIN IF ANY OF YOUR SYMPTOMS REAPPEAR! What about using whole leaf stevia extract in an alcohol suspension. Professor Eva Sapi (New Haven Dept of Biology & Environmental Sciences) proved it killed Lyme, it's biofilm & co-infections. She used it to cure her own Lyme. The study was published in The European Journal of Microbiology & Immunology. There are many other docs agreeing with the power of Stevia, as well my docs. From Tish Tamowski - We have heard of two people who were in wheelchairs diagnosed with ALS, one on a respirator with virtually no movement. Both got considerably better with antibiotics to the point where they could walk again, but then, it was a temporary fix and both have since died--of Lyme not ALS. One of them had as his doctor one of the top Lyme guys in the country, yet still died. So if you feel there is any chance that your ALS could be Lyme inspired, do your research and find a way to rid yourself of the Lyme. I found these articles just recently. Although the first one is about toxins and kids, we are all subject to the toxins around us. Have you cleaned up all the toxins in your body and environment that you can? Another serious toxic issue is mold, and we have heard of PALS getting ALS from mold. If you live in a house with mold, you cannot get well if you stay in that environment no matter how many therapies you try. Another toxic danger in our world today is cell phones. Dr. Mercola's newsletter of Aug 1, 2017 talks about the dangers of cell phones. He mentions Senator McCain. For those of you that live outside the United States, Senator McCain is a Vietnam Veteran who was a prisoner of war in Vietnam and has served in the US Senate for many years. He was just diagnosed with a brain tumor. Of interest for PALS is that Dr. Mercola mentions amyotrophic lateral sclerosis (ALS) in the article as to how cell phones, etc., can damage the mitochondria. We continue to search for helps for ourselves and our PALS. We hope you are doing your research as well. We were sent a short video about the power of the mind and your ability to heal. We realize that it is extremely hard to keep the mind in the right place when the body is doing things it should not. All three people in this video should not have healed but they did. The first step in healing is believing you can and then giving your body the proper tools to do so. Here may be another tool. We had a PALS and his family come to see us on their way to the eclipse (just an hour north of us.) Jim was talking about how his iron levels were incredibly high and how he is working to lower them. Then just a couple of days later, Rachel Rebman posted an article from Life Extension Foundation that gives an extensive explanation as to why high iron levels are so dangerous to neurology and what can be done to resolve the issue. ALS is not mentioned specifically, but Alzheimer's and Parkinson's are, which are much more common neurological diseases that get more research dollars than ALS. A couple of the correct tests could tell you if you are high in iron and then you could work to correct it. Finding the right answers for you may be the key to your healing. Why do I tell you this? Because a major factor in healthy bones is the acid-alkaline issue. Our bones do not like an acid environment. Our bones are not the only thing that suffers from an acidic body. Our whole body is out of balance when the acid-alkaline balance is tipped either way. ALS is no exception. Disease loves to live in an acidic body. We all probably know that sugars are not really good for us, but because they taste so good, we indulge. Here are some articles that discuss the importance of using very little sugar, 1. the serious dangers of sugars, 2. four sugars that are healthy (in moderation of course), and 3. how to detox the sugar from your life. Many years ago, I was sick to my stomach after every breakfast, but back then my breakfast was almost strictly carbs and sugars. I also had two brothers that had been diagnosed with diabetes. Through Dr. Mercola's website I learned that if I wanted to prevent diabetes, I needed to keep my total sugars for each day at 25 grams. So in essence, I did a sugar detox, but not exactly as explained in the third article below. What they mention about how our taste buds can change is true. I cannot eat a bite of a donut without feeling that "Wow, that is too sweet" and being sick to my stomach. We have heard that doctors will tell PALS to eat a high carb diet, because they know that PALS lose weight. Those who get a stomach tube are given a liquid supplement that is mostly sugar. We heard from one caregiver whose wife was in that situation and had developed massive fungus issues. Once he started her using Liquid Gold, her fungus issues began to subside. (She was getting nutrition instead of inflammatory, fungus-forming sugar.) We believe that weight loss comes from two sources, a digestive system that is not working well and an ALS diagnosis which creates many negative emotions. Nutrition cannot be processed and utilized by the body when the mind is in a negative mood. The exchange for sugars is good quality fats which the brain needs and which help us feel full instead of starving and craving sugars all the time. We hope that your diet has changed to encompass healthy foods as the main stay of your diet. I would give you this information right after Halloween, but Thanksgiving and Christmas are coming right up. Perhaps have very small servings of a little dessert, but none the day after or the day after that, etc. Today is Thanksgiving Day, November 23, 2017. We decided this would be a good time for me to write our monthly update. It was six years ago yesterday that we sat with our neurologist in the exam room and listened, as all PALS do, to the most depressing, fateful, and discouraging report of our lives. As every PALS that we have had the privilege of communicating with over the last six years of this journey, we listened to a review of all the tests and lab reports, and were simply told the disease was not only fatal, but it was untreatable. We were told we were not candidates for any clinical trials or experimental treatments, but when we were ready for hospice, they would be able to assist. Though my neurologist would only say that the average life expectancy was 3 to 5 years, my general practitioner told us just a week later that one year was possible, but that I had no chance of seeing two. Two days ago, on the 21st of November, I took my sweetheart of 48 years to Mesa, AZ, some three hours from our winter home in Yuma, for a lovely commemoration of our wedding ceremony, including a nice lunch, and later a dinner following an uplifting movie, “Let There Be Light” (I highly recommend this movie). The sweetness of this little escape is heightened by the realization of the true gift we have been given; several more years here together on our way to eternity. We returned home yesterday, Wednesday, the 22nd, where I celebrated the other significant event, “the diagnosis”, by walking a round of golf. Admittedly, it was only a 9-hole par three, and I didn’t play my best round, but I walked and I played. As we have had the great privilege of coming to know so many of you, our PALS, and those that love you, our greatest yearning is that each and every one of you can have the success we have had. Though we believe all the physical things that we have done, the diet changes, the supplements, the detoxing and oxidative therapies that are now a regular part of our lives, have impacted our journey, the greatest gift we can give all of you is the gift of hope. As you come to know us, to know our story, our struggles and our successes, we trust that you will know we are real. We move forward every day and live life to the fullest. You must know that as such, you also can do what we have done. I received a request from Dr. Bedlack of Duke University to complete another ALS-FRS-R to evaluate any changes in my condition. Of the twelve rating questions, I scored 4 out of 4 on ten and 3 out of 4 on the other two. Forty-six out of 48 sounds very impressive, but the two “threes”, “Walking” and “Climbing Stairs”, demonstrate clear signs I am not yet 100% healed. However, six years ago, my total score on the same test would have resulted in a score of 33 to 35. Though I acknowledge I still have a way to go, the improvement over these past six years is truly a blessing in our lives and is considered a miracle by many dear friends. We have said many times that we believe one of the most important tools in healing is to heal the heart and the mind by giving service to those around us. For this, we owe a great debt of gratitude to all of you, our dear friends, for letting us into your lives as you put your own programs together for healing. We hope you recognize that you do not wait until you have found healing to implement this most important ingredient into your protocol. These little acts of kindness do not need to be for someone worse off than yourself. In the throes of this vicious disease, those may seem difficult to find. But it is very easy to find others you can lift, or touch in some way, and make their day brighter. Always find ways to lift those that come to lift you. My hope is that as each one of us continue our struggle with this monster, that our lives will be better, whether or not we are as successful as we would wish. We must remember that we can only do all that we can, and that we must leave the rest is God’s Hands. Please know that we are here, and welcome your contacts, whether for the first time or the tenth. We know well the path you are treading and thank you for letting us play a small part in your journey.